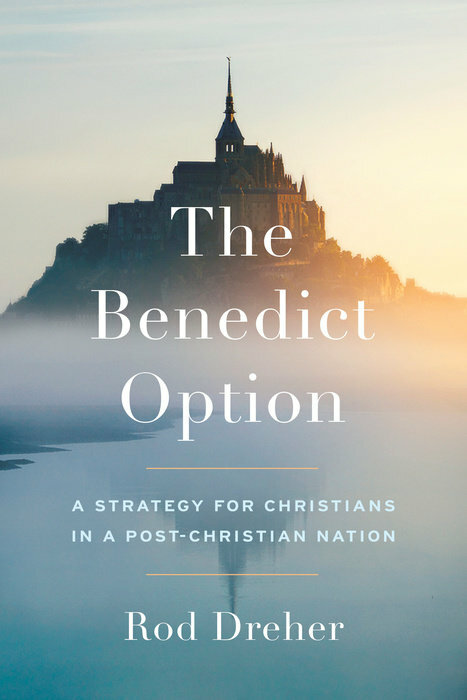 The Benedict Option: A Strategy for Christians in a Post-Christian Nation, by Rod Dreher, Sentinel Press, 2017, 262 pp. One might not be inclined to read a formal schismatic’s thoughts on how Christian’s should comport themselves in the secular world. 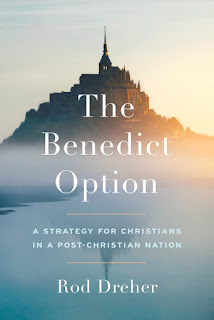 But two things might persuade one to make an exception for Rod Dreher’s The Benedict Option: first, a favorable mention of the book by the Rt. Rev. Abbot Philip Anderson of the traditionalist Benedictine monastery at Clear Creek; and second, the bitter dismissal of the book by many mainstream Catholic pundits. And one would not be disappointed. While the criticisms of some reviewers of the book as gimmicky and inconsistent have some justification, Dreher’s overall analysis of the current situation in Western Europe and North America is accurate, and his suggestions for a practical response to the situation are sensible. In fact, Dreher’s insights can very easily be developed into an argument for Catholic Traditionalism and against the anti-traditionalism of the Catholic mainstream since Vatican II. Dreher’s book is not, of course, immediately concerned with debates about Vatican II and Catholic traditionalism. His concern is with the proper approach of Christians (including schismatics and heretics of various “denominations”) towards contemporary culture. He argues that Christians should not see their main purpose in propping up the declining institutions of the post-Enlightenment social order, but should rather focus on forming counter-cultural communities. Just as the early Benedictine monks did not concern themselves with propping up the institutional remnants of the Roman Empire, but rather with forming new kinds of communities. Abbot Anderson, in his discussion of Dreher’s book, points to the contrast between St. Benedict and his great contemporary Boethius. Boethius worked tirelessly as a senator and consul in a Rome under the power of a barbarian King. St. Benedict did not, and yet, Abbot Anderson writes, “there is little doubt that the fruits of St. Benedict’s vocation far outweigh those of the Roman senator and martyr.” Louis de Wohl, in his novel Citadel of God, imagined a scene in which the Gothic king Theoderic persuades Boethius to serve in his government. “I would love to say no,” Boethius answers, “But when my mother is a prisoner, held captive by an honorable foe, and that foe charges me to look after her… can I answer him: No, you have taken her prisoner, therefore it’s up to you to look after her. I will nor lift a ﬁnger to make her lot easier?” And so Boethius becomes magister officiorum— only to later be put to death by the barbarian king. Dreher is appealing to American Christians who have a similar desire to serve their country, even as that country becomes more and more corrupt. It is not enough, he argues, to elect Boethius-like politicians who will try to erect legal barriers to the slide into barbarism and corruption. Instead we must, like St. Benedict, form new kinds of communities where virtue can be practiced and the faith passed on with some measure of distance from the barbarian tide. And the practical suggestions that Dreher gives for such communities look a lot like Catholic traditionalism. The Vatican II strategy had two related elements: first, it emphasized finding common ground with modern culture. And therefore it reduced or abolished many elements of Catholic life that set Catholics apart. And second it tried to make Catholicism accessible and easy, and therefore reduced or abolished those elements of Catholic life that appear difficult. Dreher sees very clearly that such a strategy is a recipe for self-secularization. To preserve the faith one must on the contrary emphasize what sets us apart from secular culture, and cultivate the difficult disciplines that form the heart to love the City of God, rather than the City of Man. Consider three examples: liturgy, fasting, and censorship. The ancient Christian liturgies, Dreher writes, “form our imaginations and our hearts.” Therefore, “we must not reject Christian liturgical tradition for the sake of being ‘relevant’ or anything else.” The application of this insight to traditionalist objections to the liturgical reform after Vatican II is obvious. The Liturgical reform reduced and vernacularized the liturgy in order to make it more easily ‘accessible’, but it therefore destroyed much of its power to form the heart. A Christian who practices asceticism trains himself to say no to his desires and yes to God. That mentality has all but disappeared from the West in modern times. We have become a people oriented around comfort. We expect our religion to be comfortable. Suffering doesn’t make sense to us. And without fasting and other ascetic disciplines, we lose the ability to tell ourselves no to things our hearts desire. Consider, thirdly, the example of censorship. In 1966 the Holy See abolished the Index of prohibited books, trusting in the “the mature conscience of the faithful” to guide them away from harmful material. But Dreher’s reflections on the power of media shows how counterproductive such a measure was. “The power of media to set the terms of what’s normal is immense,” Dreher observes. Surely the index should have been extended to cover film and TV shows, rather than being abandoned. The Vatican II strategy has often been portrayed as “merciful”; Christianity made easier out of mercy for human weakness (consider, for example, Dom Philippe Jobert OSB’s defence of the Novus Ordo). But depriving the faithful of those disciplines which are a real help in defending them against their own weakness is the opposite of mercy. It is to be hoped that many readers will learn this truth from The Benedict Option.